Harry from RaymondGeddes sent me a parcel of goodies, which included MULTIPENS. I love multipens. I always need more multipens. I'm not sure why, but I do. RaymondGeddes has school supplies and novelties - there is a huge selection of things to look through. Huge. Lots of scented things, too! So anyway. Let's have a look at this Dr. Seuss multipen! LIME GREEN MULTIPEN? Yes please. These are relatively short, quite wide, and very cute pens! They are approximately 5 inches long. One of these pens is the red with the barrel decorated with the "Cat in the Hat" hats, and the green pen is decorated with scenes from Green Eggs and Ham. There are two other designs that are really cute. I totally wish I had all four, because I have one-of-everythingitis. There are ten tabs around the top of the barrel to select the colours, and a big button at the top of the entire barrel to press to retract the selected colour. 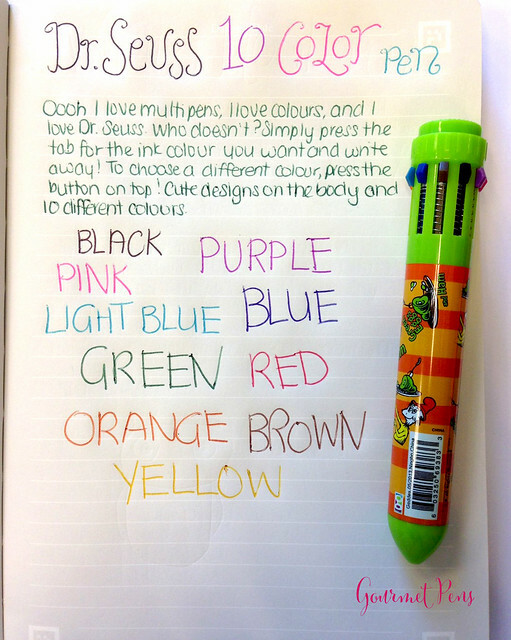 The ten colours are: black, pink, light blue, purple, blue, red, green, orange, brown, and yellow. All the colours are pretty accurate, except the red may be a little less intense than expected. It's still obviously red though. The tabs extend easily and retract really well with the button on top. Often with novelty multipens, I have found the tips get jumbled and caught when trying to switch colours. The button on top fixes that problem by retracting the entire system so you can pick a new colour. Notebook: Leuchtturm 1917 Whitelines Link notebook from Bureau Direct Academic Bundle. You'd think that, with such a wide barrel, the pen may be uncomfortable to write with. Since it's such a light and short pen, it's actually not uncomfortable to use. It's quite easy to use it extensively. I really enjoy playing with it and scribbling extra notes to myself. Since you can get them in packs of twelve, they'd be great for goodie bags for birthday parties, treats for giving out at Halloween, or for your classroom since the school year has just started. Or for yourself. Or Christmas. Or whatever. Do we really need a reason to get a multipen? No. 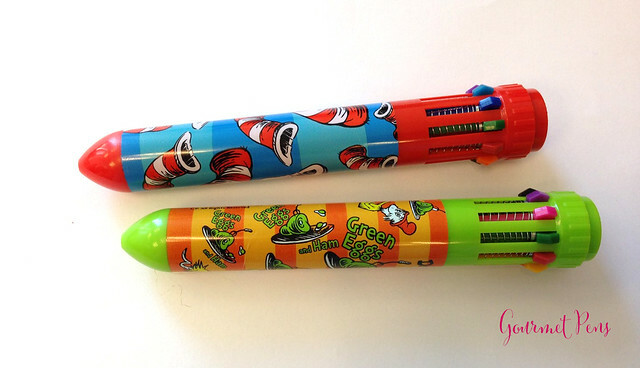 You know you are obsessed with writing instruments when you just spent ten minutes of your life reading a review of a toy Dr. Seuss multi-pen. But look at the bright side - at least you didn't write it.